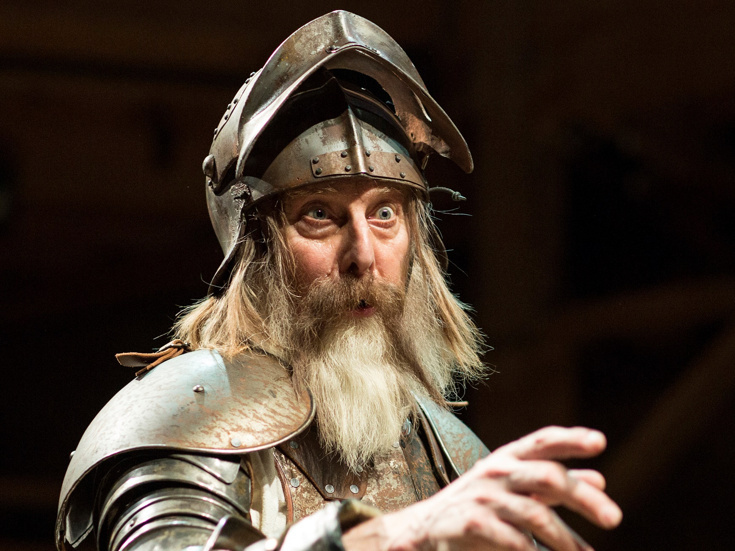 David Threlfall in "Don Quixote"
West End theatergoers are in for a treat this fall. The Royal Shakespeare Company's acclaimed 2016 staging of Miguel de Cervantes' Don Quixote will arrive at the Garrick Theatre on October 27. The new production adapted by James Fenton—who crafted original music for the play with Grant Olding—will celebrate an official opening on November 8. David Threlfall will reprise his acclaimed performance in the title role, with Rufus Hound once again playing his long-suffering companion Sancho Panza. Angus Jackson is the revival's director. "We are delighted that Angus Jackson's joyful production of Don Quixote is going to be shared with West End audiences this autumn," said Royal Shakespeare Company Artistic Director Gregory Doran. "Don Quixote's journey with his faithful sidekick is one of the world's most famous stories, and James Fenton's glorious adaptation brings Cervantes' novel wonderfully to life." Don Quixote centers on the title character (Threlfall), who after a lifetime of reading books on chivalry, decides to embark on a quest of his own. Taking up a lance and sword, he sets out to become a wandering knight, defending the helpless and vanquishing the wicked. Hopelessly unprepared and increasingly losing his grip on reality, he travels across Spain accompanied by his faithful and equally ill-suited squire, Sancho Panza (Hound). Don Quixote is designed by Robert Innes Hopkins, with lighting by Mark Henderson, sound by Fergus O’Hare and movement by Lucy Cullingford. Don Quixote is scheduled to play a limited West End engagement through February 2, 2019.